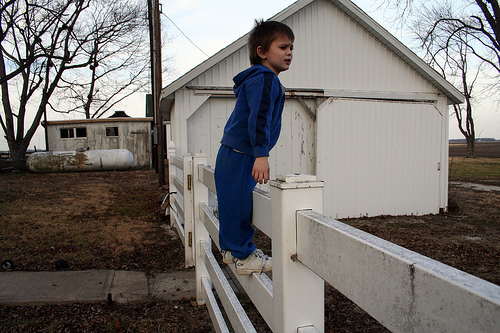 This is my kid, about five years ago, on the fence at my family’s farm. I don’t remember what he was looking at or why his face is so worried, but it’s one of the images that sticks in my head when I’m writing about that place. I’m not back there during the winter months as much as I used to be, but a vision of stark branches and wincing at a breathtakingly sharp wind are still my knee-jerk reactions to the word “Illinois.” Why doesn’t that boy have a coat on? ?